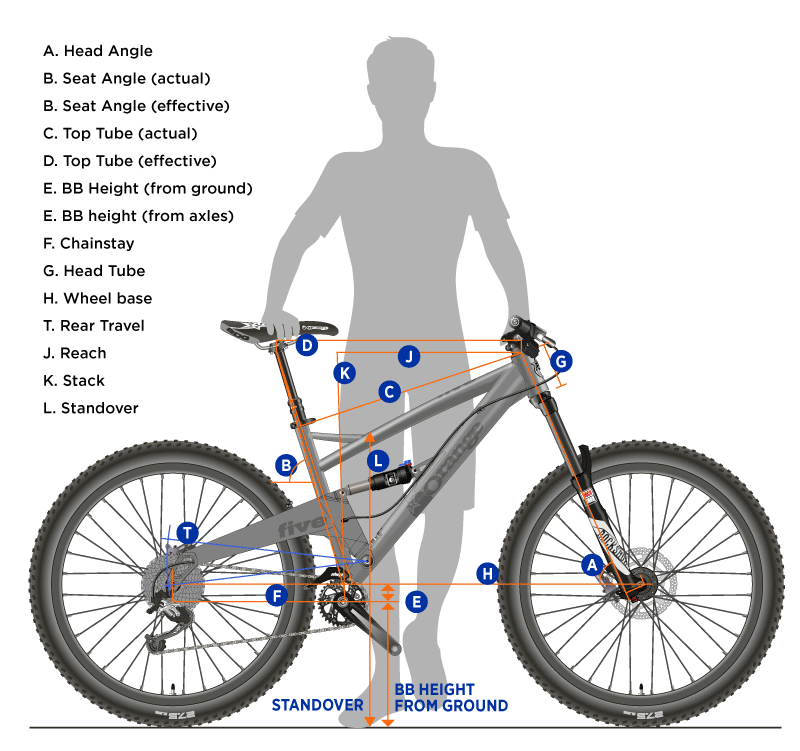 This is the section to find frequently asked questions about your Orange mountain bike. What is a Direct Mount Derailleur (DRD) Hanger? A Direct Mount Derailleur, or DRD, is Shimano's attempt to create a stronger frame to derailleur interface helping to provide more precise shifting. 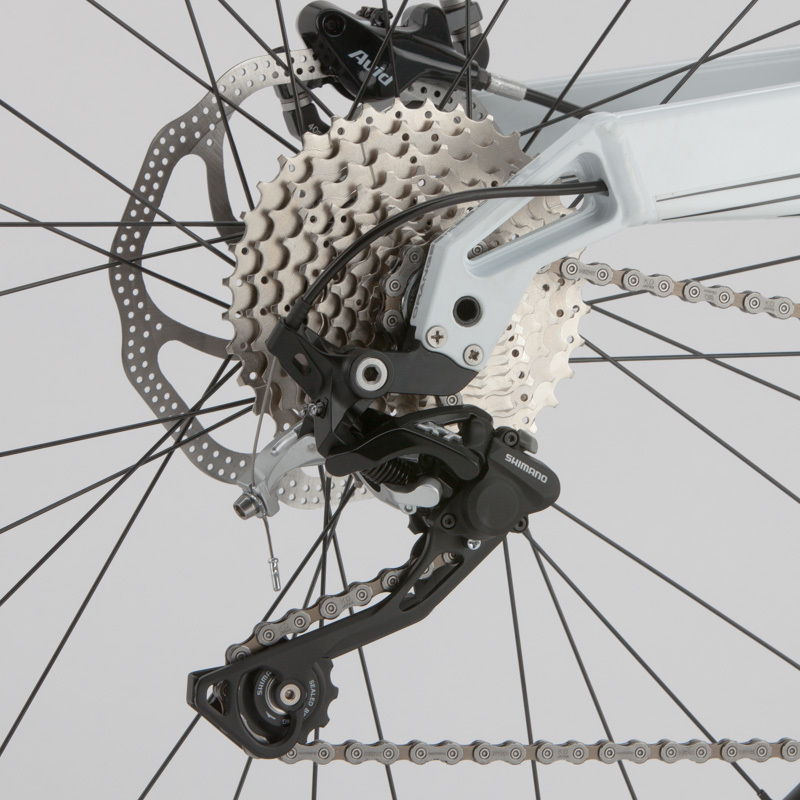 The hanger takes the place of the upper link of a conventional rear derailleur, connecting the frame to the upper pivot of a DRD specific mech and eliminating the weakest part of the system. This technology only works with specific Shimano DRD rear derailleurs, it will not work with traditional rear derailleurs and there is no SRAM equivalent. 2014 Five, Five 29 and Alpine 160 frames. 2013 Five (Maxle), Gyro, Alpine 160, Patriot, 224-evo and 322 frames. You can buy them as a spare part here. 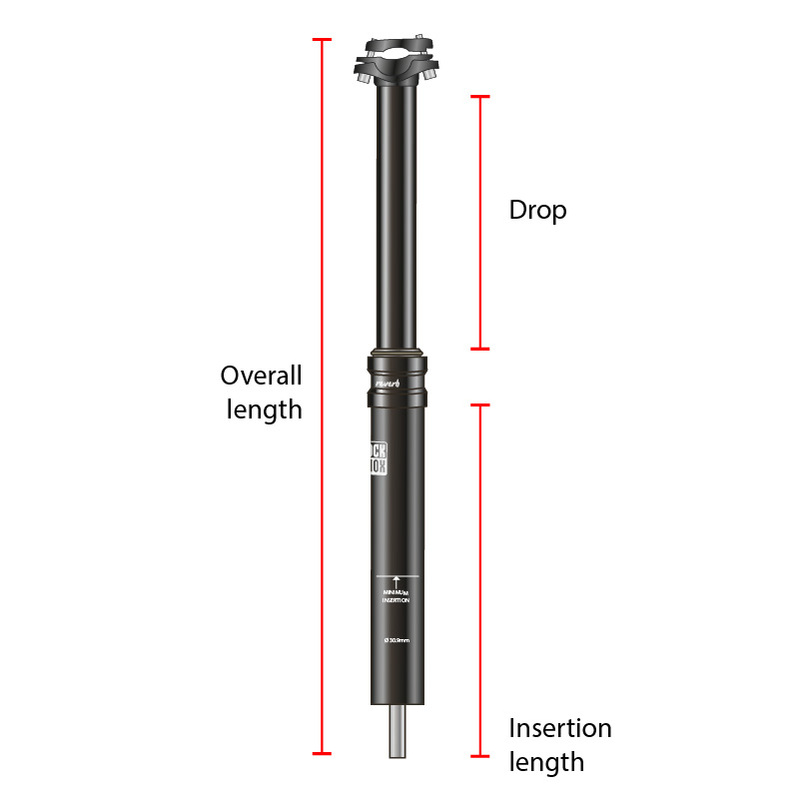 What is the correct depth to insert my dropper seatpost? Dropper seatposts have become the common standard with modern mountain bikes and it is important that you choose a seatpost with the suitable overall length and ‘drop’ to fit your bike frame in combination with the rider‘s size and desired maximum seat height.It is very important that you allow for the correct amount of seatpost insertion into your frame. 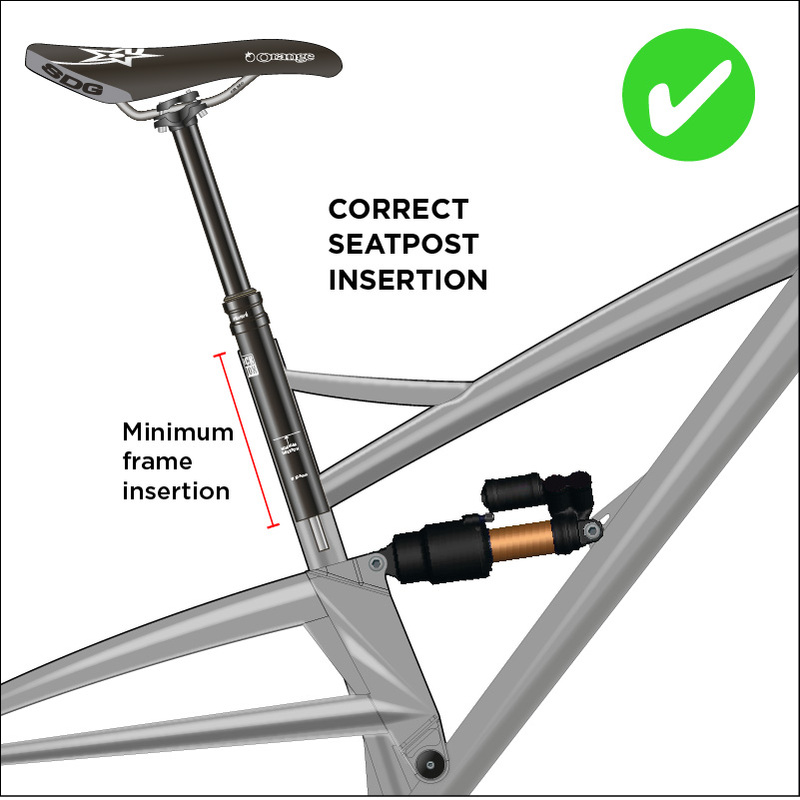 The amount of seatpost inserted into the seat tube should not be confused with the “minimum Insertion” marking on the seatpost - This mark is for the seatpost manufacturer’s tolerance for the post itself and not specific for the frame in which it is to be inserted. To maintain the integrity of your frame we recommend a mimimum insertion of 150mm of seat post. This set-up often means the dropper post’s collar is very close to the seat clamp on the frame. This is the correct set-up. 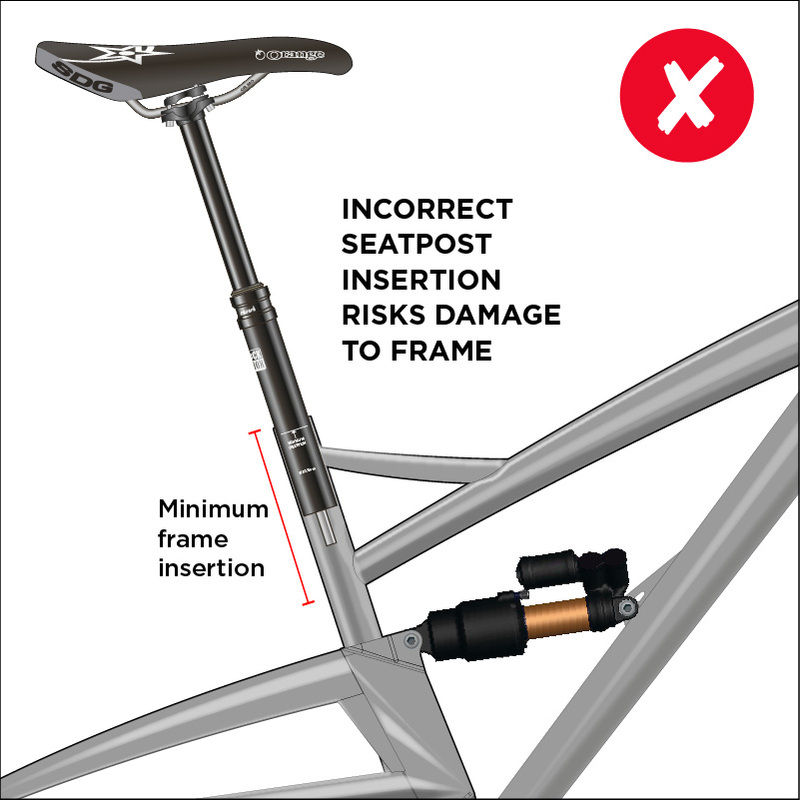 Do not run a dropper seat post with a large amount of the lower insertion length visible to do so, you risk serious damage to your frame. An incorrectly inserted dropper seatpost will invalidate your warranty. 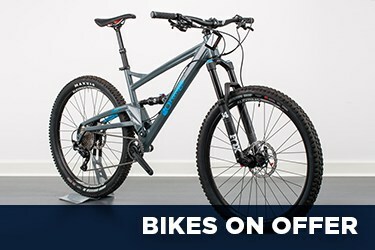 Can I buy my bike direct from Orange? We do not sell bikes direct to the consumer with the exception of our ex-demo and closeout models. ﻿We are regularly asked by people if they can use the Orange Bikes logo on team kit, videos or ads etc. While we are flattered that our logo is a popular request for such items, we cannot allow our logo's use unless it is directly connected to Orange Bikes as member of our dealer network or officially sponsored rider, team or event. 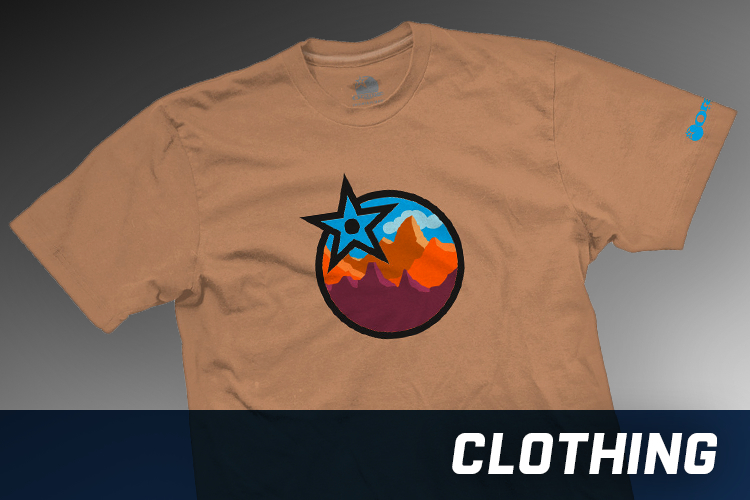 The Orange Mountain Bike website displays photographs that have been converted into digital images to represent the products available for purchase. We do our upmost to accurately present the colour, but with variations in monitor calibration there may be slight discrepancies beyond our control. To ensure the best attempts are made to provide uniform shots, we photograph all bikes in a studio at the factory using the same equipment and fixtures to control light and produce consistent representations. The nature of the product we supply means differences in frame materials, baking processes and treatments all contribute to the final paint finish. To control as much as possible we powder coat our frames in house but a particular colour or lacquer might lay differently according to material or factors involved in supply beyond our control. Finishing frames in such small quantities also means paint thickness may vary and with some colours more temperamental than others in their application, small inconsistencies may manifest themselves on the finished product. We quality control all finished frames and where inconsistencies occur, either accept or reject based on the difficulty of a particular colour. We take great pride in the hand built and hand painted frames we produce and ensure the best possible quality at every stage, if you are unhappy with any area of your bike please get in touch. What are the headset codes you use for your bikes? What headset do I need for my frame? The specification of the headset you require is determined by your frame’s head tube and the steerer tube of your fork. To make things simpler universal headset codes can be used to detail the specification of the headset required. Bearing location refers to whether the headset is a tradition External Cup (EC) fitting, a Zero Stack (ZS), or an Integrated System (IS). At first glance it might appear complicated, but it is the minimal amount of info required to define a headset now. All the manufacturers are still free to name headsets as they wish (for example Hope may still use letters and numbers) but they will explain the letters and numbers in the above terms to make fitment info universal. Tapered 44mm top and 56mm Bottom - Tapered Steerer (most commonly) or 1 1/8". 44mm Parrellel - 1 1/8" or Tapered Steerer. 1 1/8" Standard Parrellel (34m) - 1 1/8" Steerer only. 49mm Parrellel - Tapered Steerer. 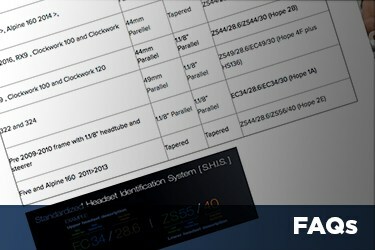 Below is a table giving examples of our most common headsets. What size seat post/front mech or bottom bracket will fit my bike? 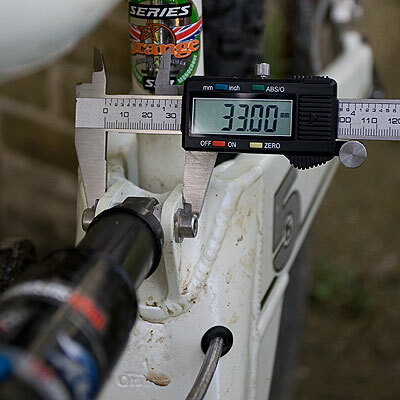 We are often asked what size front mech, seat post or bottom bracket fits a particular model and this can be one of the hardest questions to give an answer to. Because we introduced running changes to each bike, knowing the year of manufacture does not help to clearly identify which variation of the model you may have. Some seatposts were shimmed to fit seat tubes, bottom bracket length is determined by the chainset you use (sorry but we don’t check this with every chainset available) and front mech’s could be top pull, bottom pull or even plate style. We do not have records of frame numbers for older bikes so this cannot be used to accurately identify a model. What we have tried to do is give an idea of what was produced over the years, please use this guide, measure the component you are replacing and try and get one with identical dimensions. Always check with your dealer that the part you are purchasing will fit, if in doubt let them do it. What style of bike best suits me? The 'ride guide' explained. The world of cycling is full of buzz words and marketing propaganda. At Orange we try not to pigeon-hole bikes, we realise people ride as individuals, not according to the disciplines which are 'in' at the time. We created the 'ride guide' simply to show the type of riding the bike was designed for, but also its aptitude in related disciplines. The marked boxes indicate the design brief of each frame, the stars then indicate how we judge its performance within each category. The Alpine 160 was designed for all-mountain and freeride applications, the stars then show its relative strengths within each discipline. The G3 was designed for XC-trail and adventure riding; the stars again show its relative strengths while the stop signs show any restrictions we place upon its use. Downhill: These bikes are designed for one thing: flat out downhill speed. They are built to take the abuse and provide run after run of big-hit excitement. Downhill bikes are purely performance orientated within a very specific discipline. Freeride: Freeride bikes are designed for tough, technical, nadgery terrain. Freeriding can cover anything from ploughing through an Alpine rock field to negotiating your way through tricky 'north-shore' style trails in the local woods. They are built for serious terrain, but slightly higher bottom brackets and steeper head-angles generally make them more nimble at slower speeds than a dedicated downhill bike. All-Mountain: All-mountain bikes do just that, they take you up and down any part of the mountain. They have the poise of a freeride bike on the downs, but air shocks and a lighter component package make them less of a struggle to get back up again. They're the bike for those who want to pedal, but still need a bike to take the hits. XC Trail: This is the kind of riding most of us do in the UK. It includes everything from trail centre bashing to a full day of riding in the wilds. They're for anyone who rides all day and needs performance on the ups as well as the downs. But don't be fooled, just because it's an XC bike doesn't mean it isn't going to scream for more on the descents too. Adventure: Adventure covers the more traditional aspects of XC. Big days out with a map and compass, getting lost on your local bridleways, or even finding a piece of singletrack which makes the commute to work the best part of the day. Touring: Plan a route, pack your panniers and head out into the hills for a week of downtime. In our 'ride guide' this can include touring around country lanes, doing that point to point off-road ride you've been planning for years, or simply riding into work. These bikes can handle off-road riding, but they're designed for efficiency and versatility rather than trail abuse. The critical reader will notice the overlap between these categories, and this is reflected in the rating system within the 'ride guide'. A freeride bike, for example, is going to have downhill and all-mountain capabilities. Similarly, an adventure oriented bike is going to have similarities with both an xc-trail bike and touring bike? that's our point, none of our bikes just do one thing. When choosing a bike, be realistic about your capabilities. A longer travel bike does not make you a better rider; technique is learnt, not part of the bike package. If you're riding xc-trails, don't buy a freeride bike and believe it's going to make you a better rider. If you're in any doubt about what is going to suit you best, talk to your local dealer and get their advice. If you are still unsure, arrange a test ride and take the bike on the trails you ride. If you have fun and want to ride it more, it's definitely the bike for you. Riding is about feel, not the buzz word which forms the catalogue header. What size tyres can I run on my Orange mountain bike? Standard tyres have been chosen in accordance with each bikes intended use and the width which best suits the frame and application. The minimum clearance for any part of the frame should be 3mm, this allows sufficient clearance for wheel flex in the event of a heavy side load. Always ensure wheels are trued and dished correctly. When changing tyres, select a width based on the clearance of your current set up. If there is not sufficient clearance, do not use the tyre as it may damage paintwork or the frame itself. For full suspension models check clearance on the frame by completely compressing the suspension with a correctly fitted and inflated tyre. Your choice of replacement tyres must also consider fork requirements; check the fork manual or website for details on their minimum clearance requirements. Expect a minimum of around 5mm to be necessary for most fork manufacturers. Check clearance on the fork crown by completely compressing the suspension with a correctly fitted and inflated tyre. Remember, tyres can provide the most cost effective way of adapting the performance characteristics of your bike. Establish the type and conditions you are riding and select your rubber accordingly. If you are unsure of what suits you best, an Orange dealer can advise you on models and widths. What routine maintenance do I need to perform on my Orange bike? Can I get touch-up paint for my Orange Bike? Unfortunately Orange is unable to supply touch up paints for our powder coated full suspension or wet painted hard tail frames. However, luckily there are many options available if you get some damage in the paint of your bike, these range from car touch up paints which can be made to match your paint colour at places like Halfords. Can I get my Orange mountain bike re-sprayed? Yes, we offer a full re-spray service on all Orange mountain bikes. You can do this either directly with us or make arrangements through your dealer. Before sending your frame to us directly you must complete the repaint form (downloadable here). 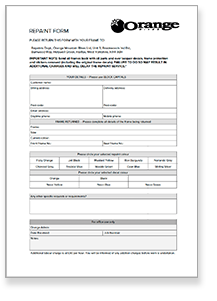 Frames without a completed form will be rejected. When sending your frame for re-spray, remove all components and stickers, heli tape or scratch patches you may have applied to the frame. Package it carefully and send it to the factory (see contact page for address) along with the completed respaint form. 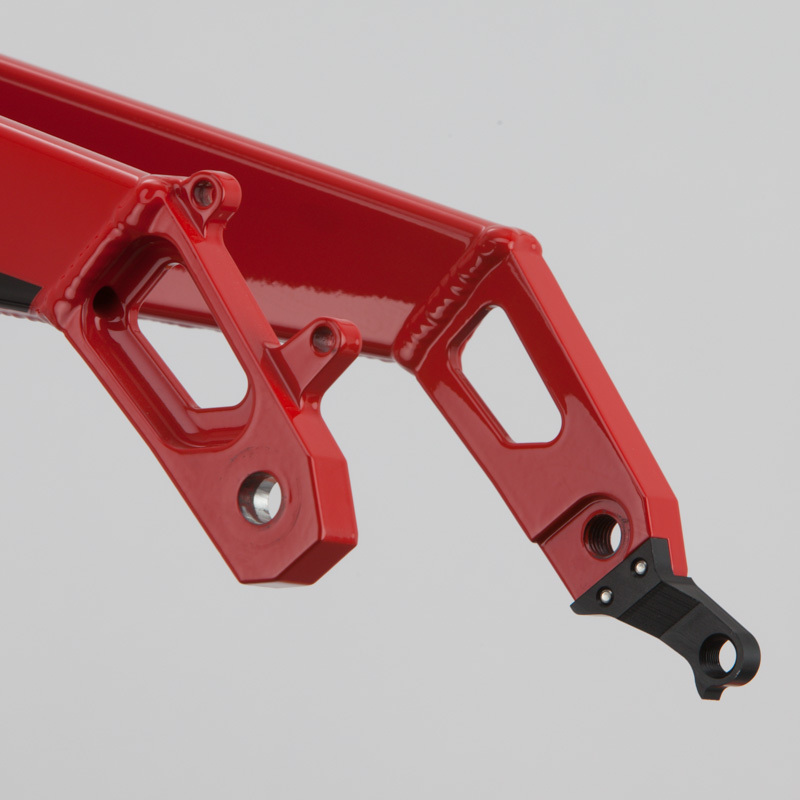 On receipt of your frame, we will strip the existing paint and prepare it for powder-coating. It will then be painted in the earliest allocated window for that particular colour. Fresh out of the oven we'll face and ream any excess paint, reassemble with new pivot bearings (for full suspension models), apply new decals and fit a metal headbadge. We will then give you a call to let you know it is finished and take card payment over the phone. Once this is all done the frame will leave with our courier and makes its way back to you. If you are local and wish to drop-off and/or collect your frame in person this is possible by prior appointment. Expect a wait of 3-4 weeks depending on colour choice and schedule. 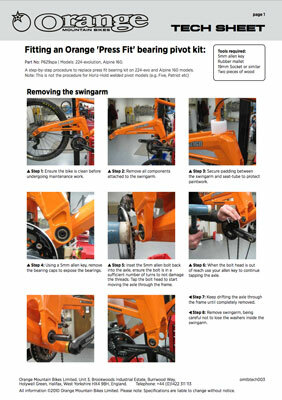 Our re-spray service is available to UK customers with Orange Bikes frames only. The warranty card supplied with the bike gives you all the details you need to check the eligibility of a warranty claim on the frame. This is also available online here. The bike should have been registered from new and proof of purchase must be sent with any returns. All warranty claims must be sent via your supplying dealer. Suspension forks, rear shocks and other parts not manufactured by Orange Bikes are covered by the stated warranty of their manufacturer. Claims on components should be sent to their UK representative again through your supplying dealer. I've damaged my frame in an accident, can I get it repaired? After a serious accident the frame should be checked for any indication of stress or potential failure. This may include cracks, deformation, corrosion, paint peeling, dents or any other marks consistent with the trauma of a severe impact. If a problem is identified and you feel that it may be repairable, e-mail a picture to us. We will then contact you with our recommendation and an estimate for any work which we could potentially carry out. Due to the process of heat treatment, any frame repaired which is over three years old may not retain its original strength, so in most cases we recommend the frame be replaced. In the event that the damage is irreparable, or that the cost would be too dramatic to justify, we refer you to the accidental damage section of your warranty card. To the original owner, and with proof of purchase supplied, we offer a discount for replacement frames damaged in a crash. This discount is a gesture of goodwill and dependant on the conditions set out on the warranty card. If a replacement is provided, be more careful where you’re riding!! Getting the right size bike is perhaps the most important decision once you have decided which model suits you best. Traditionally bikes have been sized on the height of the seat-tube, but more recently, things have moved on. Top tubes are lower and often seat-tubes are shorter, to allow for dropper seat-posts and improved standover. Modern geometry means that top-tubes are longer and stems shorter too. 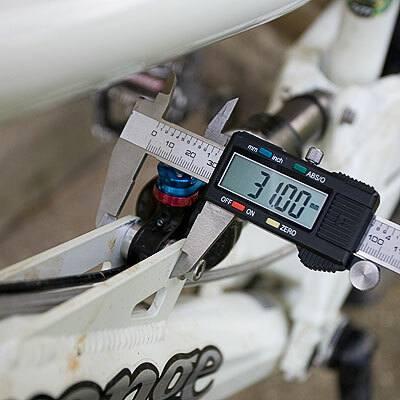 As well as the sizing guidelines on the Geometry & Sizing section for each of our bikes, we also provide reach and stack measurements to help you in deciding which size frame will be right for you. We reccomend that you make use of the expert advice of our dealers. Every rider has different needs depending on their height, shape, and what style of riding they intend to do. Our dealers can provide you with the information you need and make sure you get the fit which is perfect for you. If you are still in doubt, arrange a test ride. Each bike shows where you can find a demo model and our dealer page lists the demo bikes each store holds in stock. We also attend many demo days throughout the year and you can find a listing of them here. If there isn’t a store with the specific bike you need, any Orange dealer has access to a central fleet they may book on your behalf. These bikes must be pre-booked by your dealer, so make sure you plan ahead. Can Orange provide a work placement for my engineering course? We get a lot of speculative correspondence requesting placements under various study/work experience schemes. Unfortunately we cannot provide a structured experience which would provide the rewards traditional engineering firms may offer. Because of the way we operate, the design, manufacture, marketing and distribution is quite a unique setup which would not give you sufficient exposure and would be difficult for us to implement with the small number of staff at the factory. If we do ever have opportunities these will be advertised with application details on the website. How do I look after the pivot bearings? Your bearings are maintenance free. They come greased from new. Avoid using a high pressure washer to clean your bike as this will remove the grease. Check the wear of the bearings every 6 months. Remove your rear wheel and rear shock and lift the swing arm up and down. If they feel rough then get a new pair! 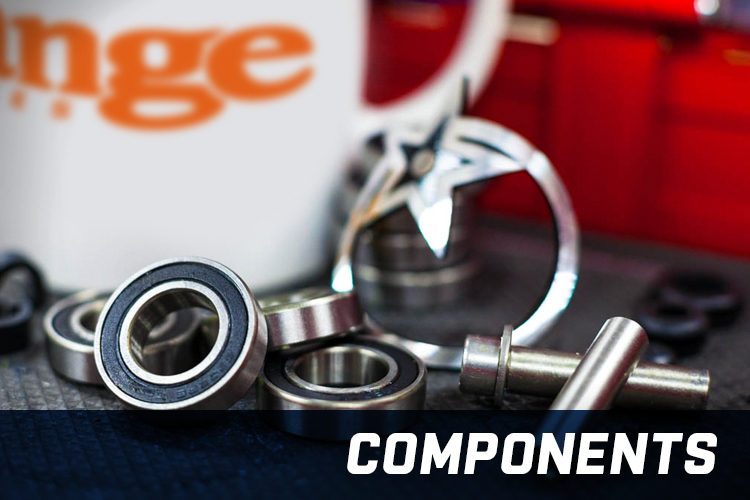 Pivot bearing kits can be purchased direct from Orange via the components page. Once you have the new bearings, you can set about changing out the old ones. 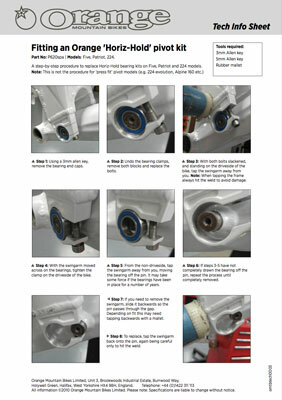 Detailed instructions can be found for replacing the bearings on HorizHold (Gyro, Five, Patriot and 224) frames as well as Press Fit (322, 224-EVO and Alpine 160) frames.